Adirondack Winery - Blog - Celebrate National Cheese Day the Adirondack Winery Way! Are there two things that go together better than wine and cheese? We don’t think so! Saturday is National Cheese Lover's Day, and here at the Adirondack Winery, we have endless yummy combinations for your to get your wine and cheese fix! Here are some of our favorite pairings, tips and must-haves for creating a delicious wine and cheese tasting at home, so you can celebrate the Adirondack Winery way! For a classic cheese plate, we recommend at least 2 cheeses, something sweet, something savory, something crunchy and of course, wine! Try to choose wines that are not too bold, but will complement the flavors in your cheese plate. We recommend Adirondack Winery Seyval Blanc and Baco Noir. Both of these wines are easy drinking and have refreshing, earthy qualities that will enhance the varietyof flavors of cheese. Prospect Mountain White - the fruity peach in our prospect mountain white is a nice foil to a soft tangy goat cheese or feta. Dry Riesling - The zesty, fresh, spicy notes of this dry white wine will cleanse your palate nicely after a grassy, rich cheese like feta or goat cheese. Barrel Aged Chardonnay - Aging in oak barrels has brought out the rich, buttery notes of this delicious NY Chardonnay which stands up to the rich, nutty intense flavors of a cheese with these same qualities. Pinot Noir - Pairing a medium bodied, red that has buttery toasted oak tones with a rich, nutty cheese will enhance the fruit notes in the wine. Our Pinot Noir is the perfect red for this! Syrah - The peppery notes and smooth flavor profile of our Syrah makes this a great red to pair with dishes featuring melty mild cheese (think lasagna, tacos, pizza etc). Gewurztraminer - The sweet aroma of our Gewurztraminer, followed by the tart apricot flavors pair nicely with a young or smoked gouda. Cabernet Franc - This well-balanced red is deep and dry with pepper notes, raspberry tones and a touch oak & of spice, making it a versatile wine that pairs well with complex, smoky cheeses. Wine & Cheese Pairing Wheel – No more guess work ... spin this wheel to pick the perfect cheese to go with your bottle of Adirondack Winery wine. You'll find a white, red, and dessert/sparkling wine suggestion for everything from Asiago to Taleggio and everything in between. Available online or in-store. 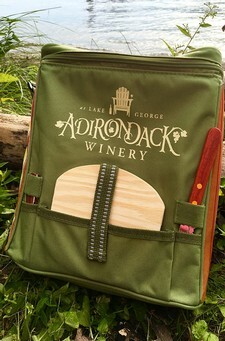 Adirondack Winery Picnic Cooler Bag – You can pick up some chilled wine and cheese at our Lake George Tasting room along with this fully insulated cooler. Nice and roomy with plenty of space for wine, cheese, snacks and more, this picnic bag comes neat and organized with corkscrew, cheese board and a knife! Take a nice lakeside walk and have a relaxing picnic by the water in Lake George Battlefield Park. Don’t forget stemless plastic tumblers for you wine too!